Creative 360 will host a Yes We Can! 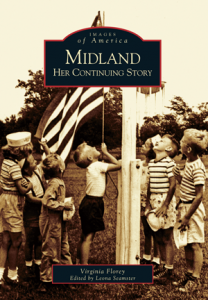 Tuesday Tribute featuring Virginia Florey and Leona Seamster and their book “Midland: Her Continuing Story” on Tuesday, April 30, 2-3:30 p.m. Enjoy lively conversation, tea and treats. Admission is $5. Midlanders Virginia Florey and Leona Seamster shared their book “Midland: The Way We Were,” during the 2018 Yes We Can! season. This year, they return to present “Midland: Her Continuing Story.” They will share their fascinating research and slides on the history of Midland and its neighboring towns – Averill, Sanford, Coleman, Hope and Edenville. These best friends have great-grandfathers who came to Midland County in 1869 from Chemung County, New York. Their fathers worked together at Dow Chemical and were best friends. It wasn’t until their 45th high school reunion, however, that Virginia and Leona became friends. Creative 360’s Tuesday Tributes offer an opportunity to hear from and about an array of fascinating seniors – their lives, their creative process, and their adventures. Always on Tuesdays at 2:00 p.m., they offer lively conversation, tea, treats, and time for Q&A. There were ten Tuesday Tributes in the Yes We Can! schedule this year. This is the final one until 2020. We hope you have enjoyed them all.